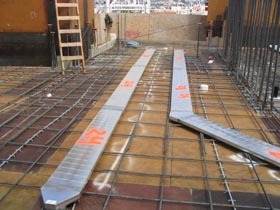 The ECCODUCT™ system is a rectangular spiral seamed duct embedded in the structural concrete floors of high-rise buildings. The ECCODUCT™ system has a 3-hour fire rating on all encased components and has passed extensive testing to give trouble free installation and service. The primary use of ECCODUCT™ is to exhaust air from bathroom fans, range hoods, and clothes dryers but can also be used for fresh air intake and supply air. ECCODUCT™ is a complete engineered system. It consists of a full range of terminations, couplers and fittings. Custom fittings can also be manufactured for specific applications. ECCODUCT™ is presently used in a multitude of structures and is backed by more than 45 years of design and manufacturing capabilities of ECCO Manufacturing. ECCODUCT™ offers the ultimate in reliability. Automated manufacturing equipment ensures consistent quality and ease of installation. 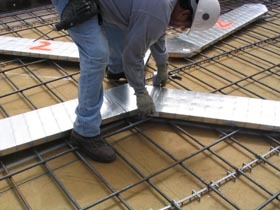 ECCODUCT™ is manufactured in 10 foot lengths, drastically reducing labour costs to install. It allows extreme flexbility in design and layout, making both the designers and the fitters jobs easier. ECCODUCT™ eliminates the costly use of dropped ceilings to conceal pipes and elbows used in traditional methods. It's also very strong, resisting deformation even under the direct impact loading of 440 lbs. of aggregate. ECCO inventory levels allow for quick, complete and on time deliveries. If you want to learn more about this exceptional product or you have an existing application you want to discuss, call us today! All testing performed by Intertek Testing Services NA Ltd. Warnock Hersey and Hardy Associates Ltd.